Each year I compile my annual prospect rankings and count down the Phillies organization’s top 25 rising minor league talents. In the coming weeks, I’ll be posting reviews for each of the top developmental talents that appear to have the brightest futures for the Phils organization. Taken into consideration when compiling the list is age, minor league performance relative to levels played to date, value to the organization as well as the player’s future potential and proximity to the big leagues. These rankings will not include players over the age of 25 or individuals that have already spent lengthy stretches in the big leagues. For example, J.P. Crawford and Jorge Alfaro, who are both previously, highly-ranked Phillies prospects, graduated to the big leagues last season and spent a month or more at the top level and won't be included in this year's rankings. Others moving to the majors and progressing out of prospect status are pitchers Ricardo Pinto, Ben Lively and Nick Pivetta. Yacksel Rios, a reliever, spent more than a month with the big league club last year as well. The 24-year-old sported a 1-3 record with three saves, a 1.92 ERA and a 10.2 K/9 mark in 37 games combined with Double-A Reading and Triple-A Lehigh Valley last year. While Rios only appeared in 10 MLB games and could still get consideration for this list, I'll use his time in the majors as an excuse to make room for someone else. 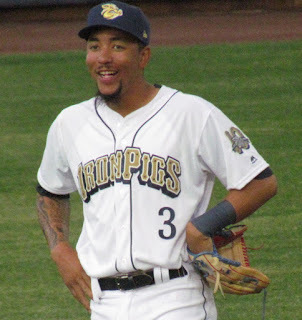 Outfielder Carlos Tocci was taken in the Rule 5 draft in December by the White Sox and was then traded to Texas. The 22-year-old Venezuelan, who was ranked 20th on this list last year, had a very good season in 2017, batting .307 and making the Eastern League All-Star Game in 113 games for Reading and wrapped up the season at the Triple-A level with Lehigh Valley. Players that garnered consideration for this list but missed ranking among the top 25 names include several hurlers. Righty Kevin Gowdy, who missed the entirety of the 2017 and underwent Tommy John surgery in August. The 20-year-old is expected to miss most of or all of the 2018 season as well. Gowdy was the Phillies' 2nd round draft selection in 2016. Reliever Austin Davis started to really make a name for himself with a remarkable 2017 campaign at the Double-A level for Reading. 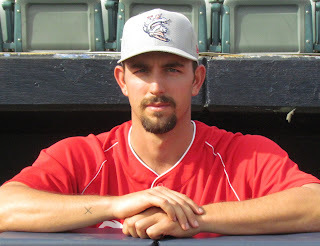 In 32 relief outings following some time with Clearwater the 24-year-old lefty sported a 4-2 record with three saves, a 2.87 ERA and just about a strike out per inning pitched. Davis should be a valuable contributor out of the bullpen at the Triple-A level this year and may get a shot at the majors when a spot opens up. Class A starting pitcher Nick Fanti made headlines last season with a pair of no-hitters for Lakewood and could begin to get consideration on Phils' prospect lists with various outlets. The 21-year-old left-hander posted a 9-2 record with a 2.54 ERA and more than a strike out per inning in 21 games for the BlueClaws. Already showing he can dominate in the Sally League, Fanti will move up a level this year and hopefully will continue to improve. Righty pitcher Spencer Howard, who was the Phillies' 2nd round draft pick last year, is getting some attention among rising prospects. The 21-year-old righty sported a 1-1 record with a 4.45 ERA and 12.7 K/9 mark in nine starts for Class A short-season Williamsport in his first experience as a pro last year. Additionally, some players from last year's list have simply fallen out of my top 25. Mark Appel, the former 1st overall draft pick that the Phillies acquired in the Ken Giles trade from Houston, missed the list as well as considerable time for the second straight year due to injury. At 26-years-old, the right-hander has aged out of these ranks. Appel was 21st on this list last year. Outfielder Jose Pujols showed loads of power and potential with the Class A BlueClaws in 2016, but his skills at the plate did not translate well up just one level with the Class A Advanced Threshers last year. He saw his .746 OPS with Lakewood fall to .552 with Clearwater. The 22-year-old Dominican ranked 19th on this list last year. 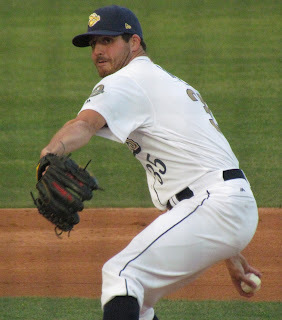 Right-handed pitcher Alberto Tirado, who ranked 13th on this list last year, was converted to a starter in 2016 and then back to a reliever in 2017. While the organization has tweaked things with the 23-year-old Dominican Republic native, he hasn't looked as promising as he once did. In 10 relief appearances in Double-A after a solid campaign with Class A Advanced Clearwater, Tirado posted a 6.75 ERA with no decisions while striking out eight and walking 19 in 12 innings pitched. I am hopeful that Tirado can bounce back and help a pitching staff at the upper levels this coming season. Check back here on PhoulBallz.com often, as the new season approaches, for the unveiling of this year’s top 25 ranked prospects within the Phillies organization.